China was fantastic -- This whole musical tour was like our own "Hard Day's Night"! The schedule was hectic but exhilarating. Our shows were varied, from large outdoor concert events with thousands of people, as well as beautiful large concert halls such as the Beijing's Forbidden City Concert Hall and Nanjing's Cultural Arts Center, to You Fu Castle, a large rousing dance nightclub in Xiamen, on the southeast coast of China. The Chinese people we met were no different than the folks back in the USA. They appreciated us, the music, the cultural exchange and the genuine effort on our part to make them feel at home with Mary and me and the band on stage as well as off stage. They also made a genuine effort to make us feel very much at home with them too, on stage and off. This musical tour was truly a ground-breaking event for all involved. This type of thing had never been done before. In my own experience years ago, I was tour photographer for Bruce Springsteen in Germany, France, Belgium, Switzerland, Spain, Denmark, Holland, Norway, Sweden and Great Britain, a truly amazing experience. Thank you, Bruce! I have always and will always create through photography and music. Projects have been rich and varied. It really doesn't matter what the creative form is for me, be it F8 or A-minor. I now was able to create a situation be on tour in a foreign country as a musician, much like my photo adventures with Bruce and the E-Street Band, but now bringing my own photographer with us. For me, this was truly a grounding experience  I'll never take for granted wherever this might take us. My musical path has allowed me to switch hats so to speak, taking me on just as amazing a collection of adventures for Mary and me. Nineteen dates alone at Jones Beach Bandshell this summer 2002, doubling our 2001 Jones Beach schedule - as well as our many other shows. Great reviews in Newsday and ASCAP's prestigious Playback Magazine - a real tribute to what we are doing  we must be doing something right! Our tour adventure was some 23,500 miles from start to finish. Starting our trip in NY, we flew United from LaGuardia to Chicago, connecting for a 13.5-hour direct flight to Beijing. There were 8 of us: our five band members: Mary Lamont, myself (Jim Marchese  lead guitar), Cosmo LoCricchio (bass), Frank Patterson (drums) and Tom Murphy (rhythm guitar/harmonica), along with Mary's father Cam Lamont, our son Eric Marchese, and our good friend Leslye Abbey, who came to film and photograph the whole adventure. The Chinese crowds were excited and loved how we performed. There were sound checks (in Chinese of course) and almost always a surprise around every corner. But we made it all work. 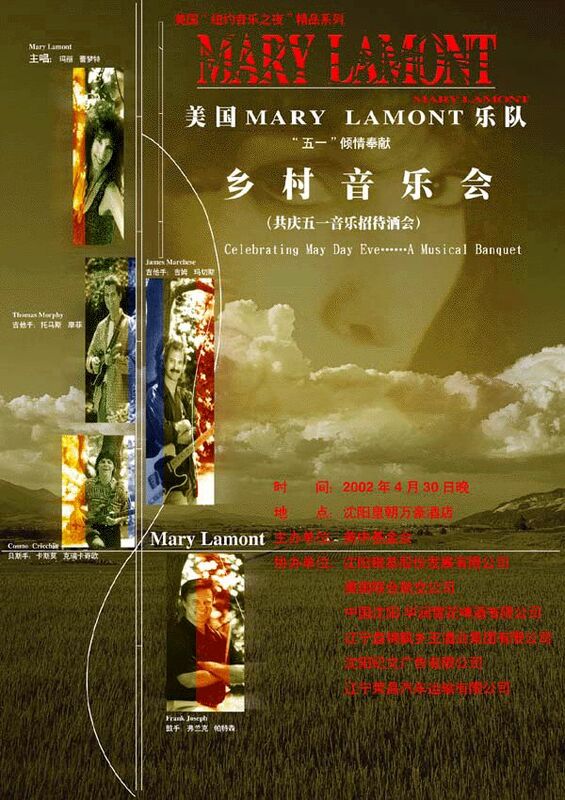 Interviews with TV stations, 30-foot banners with Mary's name in English and Chinese, brochures and posters of the band. Exotic side trips to places like China's largest waterfall in Guizhou's Huangguoshu National Park  Some of our band members took a mile-long "glide ride", a few of us hanging from a rope hundreds of feet over a ravine. Also The Forbidden City (Beijing and Shenyang) and of course, the Great Wall of China. In most cases, we were the only Westerners on the planes or at the concerts. And we were treated like gold wherever we went. Receptions and dinners were given in our honor; huge bouquets of flowers presented to us at every show, rousing encores, private buses for us everywhere. We couldn't have asked for a better reception. We zigzagged across China, (via Air China, China Southern, Xiamen Airlines), 10 shows, 2 weeks, starting in Shenyang, where we performed in the beautiful Shenyang Marriott Hotel, then outdoors the next day in Civic Square, (where after the show the crowds completely surrounded our van, pushing paper and pen through the windows for autographs, just the start of the energetic response that was to follow us for the next two weeks), then a 5-hour bus ride to the stunning coastal city of Dalian. The outdoor show there was large and grand. Southwest to Guiyang, over to Xiamen, and then up to Beijing and southward to Nanjing. Another 5-hour bus to Shanghai to catch a plane to San Francisco, connecting to a JFK-bound flight for home. 4 & 5-star hotels all the way, and the food - can't even describe -some we didn't even know what it was - it was fabulous! We were treated to a remote island retreat, which had previously hosted Canadian and Australian ambassadors. Not too bad, huh? We were covered on the news on China's premier TV station CCTV as well as Beijing's TV station BTV and Star Tourist TV station STTV. We were also interviewed on Jiang Su TV station Satellite Channel for broadcast worldwide. Rock 'n' roll's premier Marshall amplifiers aren't usually synonymous with country twang. But with their association with England, Marshall amps are what appeared most of the time on stage with us in China. I got great tone out of those amps. But at our last show in Nanjing, we did have Fender amplifiers, which I usually use back home. Mary sang a song in Chinese, to the amazement and delight of all the audiences; they went crazy, singing along in their seats. Also some requested American songs, including John Denver's "Take Me Home, Country Roads" (Interesting, we have a musician friend who did a stint in May in Copenhagen, and he e-mailed us saying that Country Roads is the most requested song there, too. 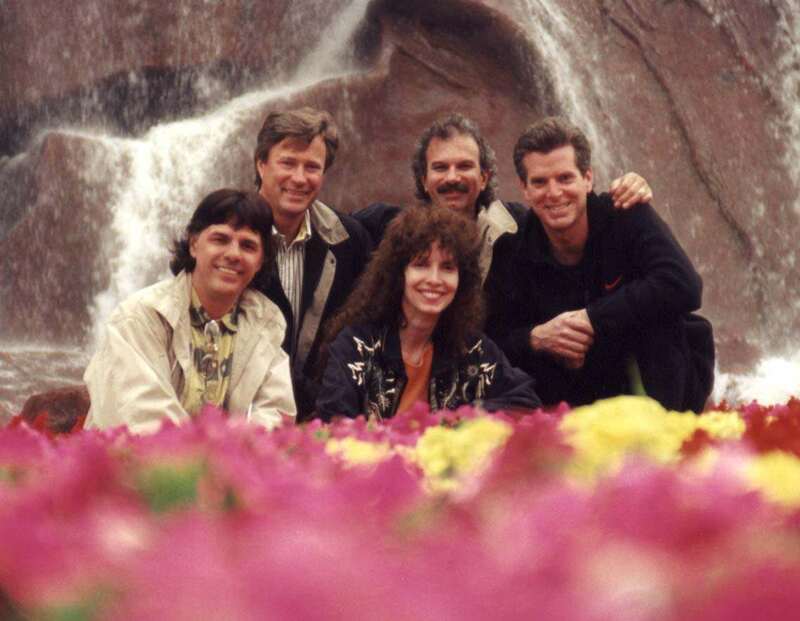 Our original songs from our CD (Mary Lamont  "You Don't Have To Knock"  Lammar Records) went over great. (It's inspirational that this whole trip was the result of Mary and I sitting in our living room writing songs!) We also performed our wedding song, an Elvis cover, "Can't Help Falling in Love", audiences loved the affection on stage in that one as well as a rousing countrified version of "Suspicious Minds" with an outstanding drum solo by our drummer Frank Patterson. We also did a George Jones-Roger Miller composition, more recently covered by Buddy Miller, appropriately titled "Nothing Can Stop Me". It seemed right for the occasion. We were asked to perform with China's renowned saxophonist and teacher Mr. Gu Zhao Ming, who also showed us the sights of Dalian, and has performed in America with some of his 250 saxophone students. Twenty of these kids opened a show for us. Music does cut across all borders. What a great experience for us all. We bought plenty, we ate plenty, we played plenty, surrounded by brand new fans. Can't ask for more than that. And we did find MacDonald's and Pizza Hut in some cities, for the occasional American fast food fix from home. Our hosts were absolutely wonderful. Larry and representatives (Eric, Warren, Lilly, Michele, Tina, and Nancy) were there at every minute to help us with anything we needed. My father-in-law for instance lost his passport (something you never want to do in a foreign country) at the airport, and therefore could not board any domestic flights. One of our reps, Warren, accompanied him on a 30-hour train ride to Beijing. They found the passport, and delivered it to my father-in-law when he got to Beijing. They solved every bump in the road we had, from getting all the equipment we needed, to telling us exactly what we were eating! They truly became part of our band. We met many Chinese dignitaries on this adventure, including Mr. Wen, one of the leaders of China's Liaoning Province (like meeting one of our state governors), the vice governor Mr. Zhao and the Chinese U.N. Ambassador, as well as Russian and Japanese consulate officials. We were told we were like American ambassadors bringing good will abroad, much the same way Olympic athletes will be representing the U.S. in Beijing in 2008. It's also gratifying to see people halfway round the world fall in love with my wife Mary's beautiful voice and kindred spirit the same way I did years ago. We've already been invited back ...We're ready for another visit with our new Chinese friends! Shay-Shay (Thank you) China !